A comment on D Vitkup, P Kharchenko and A Wagner: Influence of metabolic network structure and function on enzyme evolution. Genome Biol 2006, 7:R39. Recently, Vitkup et al. investigated the influence of the yeast metabolic network structure and function on enzyme evolution. They calculated connectivity for each enzyme as the number of other metabolic enzymes that produce or consume its products or reactants and used it as its centrality measure in the network. They found that highly connected enzymes evolve more slowly than less connected enzymes, are less likely to be essential compared to less connected enzymes, and are more likely to retain duplicates in evolution. Metabolic networks exhibit a hierarchical modular structure in which some enzymes perform very specific local functions, relevant only within a particular pathway, whereas others may possess a global high-level role, perhaps acting as mediators of distinct pathways . In the graph theory, the betweenness centrality measure of a node is defined as the number of shortest paths going through that node and is more appropriate for measuring the relative importance of a node in a network with hierarchical structure, such as a metabolic network . We first investigated whether significant modularity existed in the yeast metabolic network and found that the most likely modularity parameter Q was estimated to be 0.31, suggesting a significant modular structure in the network (Figure 1). Q will take an expected value of zero in any random network without modular structure. We calculated the Q values for each of 1,000 simulated random networks with the same size as the yeast network but without any modular structure. The maximum value of Q observed in these simulations was 0.12, indicating the presence of significant modularity in the real network. Plot of the modularity and a dendrogram for enzymatic genes in the yeast metabolic network. (a) A plot of the modularity against the number of branches. The peak (red line) in the modularity was used to identify the communities. (b) A dendrogam for enzymatic genes in the network constructed on the basis of the Q statistic. 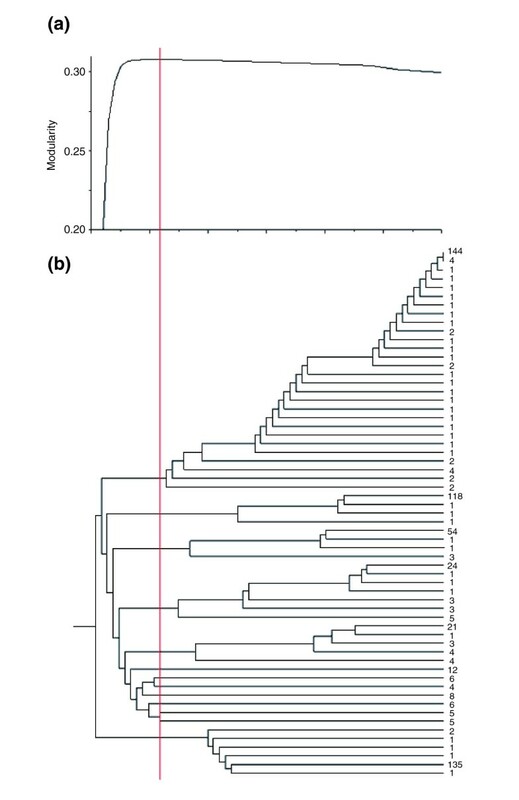 The numbers on the right of the dendrogram denote the number of nodes linked by each tip. We observed only a modest correlation between betweenness and connectivity values for each node in the metabolic network of the yeast Saccharomyces cerevisae (r = 0.46, P < 0.0001) as illustrated in Additional data file 4. To interpret the poor correlation, we simulated a random scale-free network based on the parameters defining the yeast metabolic network, but without considering its hierarchical structure, using the Pajek tool [4, 5]. We calculated the correlation coefficient between the two measures in the simulated network and found it to be highly significant (see Additional data file 4, r = 0.95, P ≅ 0). These findings suggest that the connectivity is not a good approximation for the betweenness as a measure of centrality for enzymes in the yeast metabolic network. We calculated the correlation between the betweenness and the K a /K s ratio (the ratio of nonsynonymous to synonymous substitutions) for each enzymatic gene in the metabolic network. The K a /K s values were computed using orthologous sequences of the yeasts S. cerevisiae and S. paradoxus from Kellis et al. and were used as an estimate of evolutionary constraint. Additional data file 5 demonstrates a statistically significant negative correlation between K a /K s and betweenness of an enzyme (Spearman's rank correlation r = -0.18, P < 0.002), providing clear evidence that high-betweenness enzymes evolve slowly. In the same dataset, we also observed a significantly negative correlation between connectivity and evolutionary constraint of an enzyme (Spearman's rank correlation r = -0.13, P < 0.02, Additional data file 5) as in . Furthermore, partial correlation analyses indicate that while there is a significant correlation between evolutionary constraint and betweenness after controlling for connectivity (Spearman's partial correlation r = -0.14, P < 0.02), no such correlation is seen between the constraint and connectivity after controlling for betweenness (r = -0.03, P = 0.59). It is noteworthy that the proportion of variation in the evolutionary constraint of the genes attributable to the network parameter is limited (R2 = 3.24%). There are probably at least two reasons for this limited explanatory power. First, many factors may affect the evolutionary constraint of a gene in general (see below). Second, when the metabolic network was analyzed as a graph all genes in the network were equally treated without considering differences in their functions. Nevertheless, the present study reveals that the structural feature of genes in a biological network is one of the significant and independent determinants for their evolution. It is well known that the evolutionary constraint of a protein can be affected by many factors, among which, variation in expression (mRNA) level is the dominant factor that explains variation in the evolutionary constraint of yeast proteins . Using the gene-expression datasets , we found a significant correlation between betweenness and expression level among the enzymatic genes (Spearman's rank correlation r = 0.14, P < 0.002). Moreover, a partial correlation analysis controlling variation in gene expression still supports the negative correlation between betweenness and evolutionary constraint (Spearman's partial correlation r = -0.15, P < 0.01). We divided the enzymatic genes into essential and nonessential groups according to Giaever et al. [9, 10], and found that the essential enzymatic genes had significantly higher betweenness than the nonessential enzymatic genes (nonparametric Mann-Whitney U test, P < 0.0004, Figure 2a). In other words, the relative structural importance of an enzymatic gene in the yeast metabolic network can partially explain its functional essentiality. 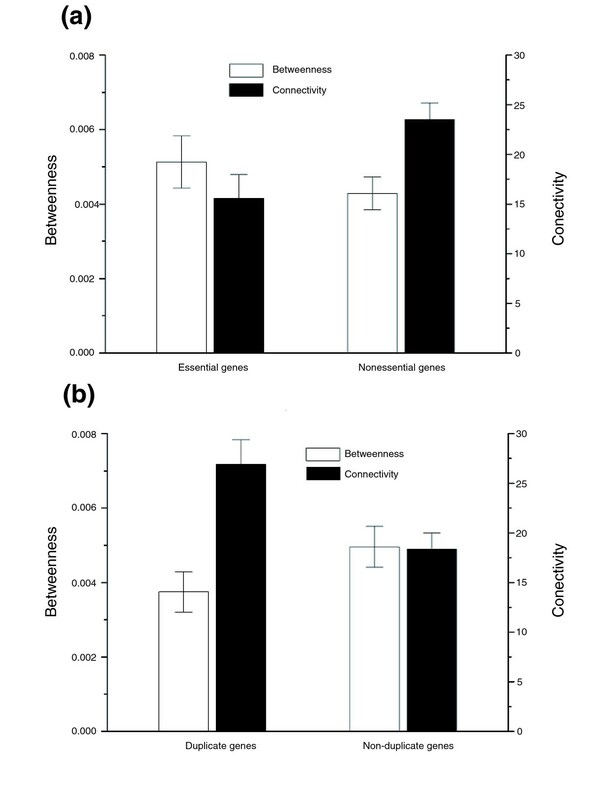 In sharp contrast, the essential enzymatic genes had significantly smaller values of connectivity than the nonessential group (nonparametric Mann-Whitney U test, P < 0.04, Figure 2a) as concluded in . Relationship of network characteristics and gene properties in a metabolic network. (a) The relationship between the essentiality of enzyme-coding genes in a yeast metabolic network and their network characteristics (betweenness and connectivity). (b) The relationship between gene duplication and the network characteristics. The standard errors in each bin are also shown. We found that the mean betweenness of duplicated enzymatic genes is 0.0038, and for non-duplicated enzymatic genes the mean is 0.0050 (nonparametric Mann-Whitney U test, P < 0.00002, Figure 2b). This indicates that enzyme-coding genes with low betweenness are more likely to retain duplicates in the evolution of yeast. Analysis with connectivity shows that the mean connectivity for the duplicate enzymatic genes is 26.89, whereas the mean becomes 18.36 for the non-duplicated enzymatic genes (nonparametric Mann-Whitney U test, P < 0.0002, Figure 2b). We calculated the clustering coefficient (CC), another measure for network characteristics, for every enzyme gene in the yeast metabolic network according to the method  and list the estimates in Additional data file 3. This measure is closely correlated with connectivity (r = 0.83, P ≈ 0), as expected from the definitions of the two measures, but is poorly correlated with betweenness (r = 0.16, P < 0.001). These findings make it clear that betweenness depicts largely different characteristics of the metabolic network from the other two network statistics. In general, the current analysis stresses the need to consider the global impact of an enzymatic gene in the complex metabolic network and demonstrates that use of betweenness has led to an opposing interpretation of the enzymes' evolutionary characteristics. Although the observations made in the present study are quite different from those in , it must be noted that the difference does not necessarily mean that one method has greater validity than the other. Lu et al. present a nice analysis that directly supports our conclusion that the structure and function of metabolic networks influence enzyme evolution. We demonstrated this fact for several different evolutionary mechanisms (for example, accepted mutations, gene duplication, null mutations) and network parameters (for example, degree, centrality, physiological flux distributions). Lu et al. reproduce our results and suggest, in addition, that - betweenness also affects the evolution and essentiality of the network enzymes. This is not unexpected (see - previous studies [12–14]); it is likely that - many other network parameters will correlate with various evolutionary properties. Studies exploring these correlations will contribute to the developing area of evolutionary systems biology . Correspondence should be sent to: Dennis Vitkup, Center for Computational Biology and Bioinformatics, Department of Biomedical Informatics, Columbia University, Russ Berrie Pavilion, St Nicholas Avenue, New York, NY 10032, USA. Email: dv2121@columbia.edu. Additional data are available online with this paper. Additional data file 1 contains Materials and methods for the analyses carried out. Additional data file 2 describes the method for the creation of a directed enzyme network from a metabolic network that was used in this study. Additional data file 3 provides original data of network and evolutionary parameters for 580 enzymatic genes in the yeast network. Additional data file 4 contains a figure depicting the correlation between enzyme connectivity and betweenness in the yeast metabolic network and a random scale-free network. Additional data file 5 contains a figure illustrating the relationship between K a /K s and both the betweenness and the connectivity. We are grateful for the criticisms and comments made by two anonymous reviewers, which have helped improve the paper greatly. This study is supported by China's National Natural Science Foundation (30430380) and the Basic Research Program of China (2004CB518605). Z.W.L. is also supported by research grants from BBSRC and NERC of the United Kingdom.